Andrew Finnigan stars in Script Club and Boundless Theatre’s production Drip, which is returning to the Bush Theatre following a sell-out tour. 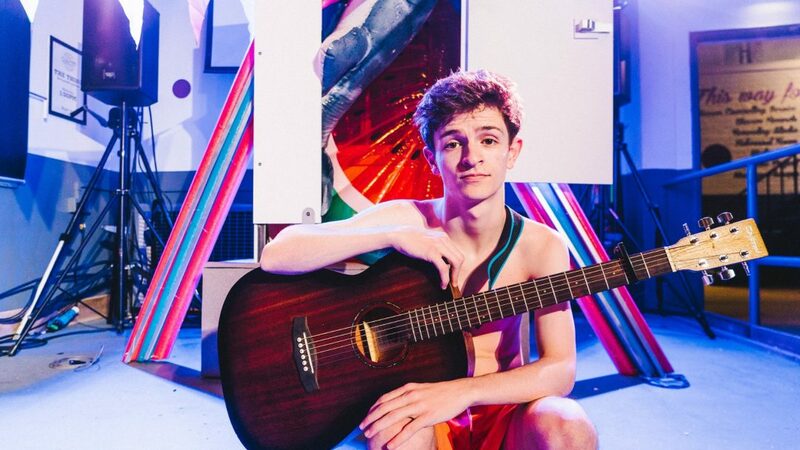 The production runs 5 Dec – 22 Dec, with previews from 3 Dec.
Drip is a one-man musical comedy about a 15-year old boy who signs up to Hull’s first ever synchronised swimming team, though he can’t swim. It tells a story of pride, friendship, and being a queer teenager in Hull. You’re performing in Drip. What can you tell us about it? So, Drip is all about Liam and his best mate Caz. They’ve set up a synchronised swimming team in Hull even though Liam can’t swim. The show follows Liam overcoming this little speed bump in his life with maximum optimism. I had worked with Tom and Matthew on their last show together Broken Biscuits and they mentioned to me they were writing a one man musical and asked if I’d be interested in working on it. It was an absolute no brainer. I’m dead lucky I get to work on another of their shows. They’re both ace. What do you like most about Tom Wells’ writing and Matthew Robin’s music? They’re a bit of a powerhouse together. I think it’s obvious in their work that they both really get each other. Their work is dead honest, and they manage to take stories from every day life and turn it into magic. Their words and music really stick with you I think, and people will hopefully take that with them when they leave the show. It’s a musical and a solo performance. How do you feel about being on stage alone for the whole performance? It can be quite daunting beforehand but once I’m on stage I kind of relax into it a bit. I need to make sure I keep my energy up for the whole hour though since it’s just me on stage so once the show is finished, I get home and the adrenaline has worn off I sleep like a baby! How has the tour prepared you for the run at The Bush? Originally the show was made in a pop up format so we didn’t really keep the show at any venue for longer than a few days so it’s really exciting The Bush will be our home for a 3 weeks. The tour has been a nice chance for us to play around with different ideas for the show, and some have came and went over the past year but now we have a couple of new surprises for our run here in London. What would you say to anyone thinking of coming to see Drip? I’d say Drip is a lovely non-christmassy Christmas show. If you want to come to the theatre and leave with a smile and feel a little lighter then definitely come along. I should probably also say, the songs are quite catchy so they may get get stuck in your head for Christmas. Don’t say we didn’t warn you! Paines Plough and Theatre Royal Plymouth Announce Cast for You Stupid Darkness!